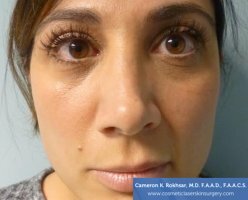 The Non Surgical 15 minute Nosejob, pioneered by Dr. Cameron Rokhsar, is a simple no downtime technique to change the shape of your nose with a few simple injections of a filler substance named Radiesse. The procedure is done under numbing cream, takes 15 minutes, with virtually little or no pain, bruising or swelling. You can return to your work or social life immediately with instantaneous results. Radiesse is an FDA approved filler substance. Dr. Rokhsar invented the Non Surgical Nosejob in 2002 and has performed more Non Surgical Nosejobs than any other physician in the world. 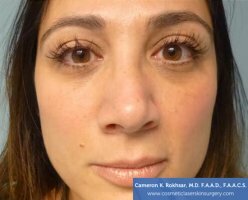 Dr. Rokhsar places a filler substance, named Radiesse, through controlled and precise injections to hide away dents, bumps, side way deviations, raise the nasal tip, or contour irregularities to restore a more symmetric look to your nose. 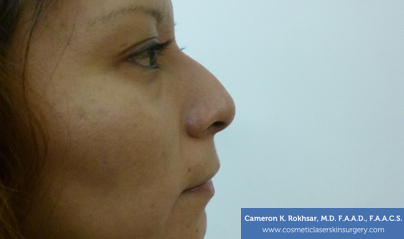 The end result is that your nose will look more proportional and smaller in your facial frame. Your results are instantaneous. We have seen a shift in demand by patients from invasive procedures to minimally invasive procedures in the past decade. For example, CO2 laser resurfacing which is the gold standard for laser rejuvenation has largely been replaced by gentle resurfacing with devices like Fraxel lasers. Since we can use Botox to elevate the eyebrow, brow lifts are less popular as they once used to be. The non-surgical 15-minute nose job is an alternative to surgical rhinoplasty for many individuals who wish to alter the shape of their nose or restore symmetry to their nose. Radiesse is natural and 100% biodegradable. There is no incidence of allergy to Radiesse, so there is no need for allergy testing. Radiesse stays exactly where you place it. In other words, it does not migrate like some hyaluronic acid based fillers. This is extremely important for injection into the nose. It lasts twice as long as most other fillers that we have available, approximately 1 year. Dr. Rokhsar likes to use Radiesse for simultaneous chin augmentation. This is a complementary procedure to the non-surgical nose job. Radiesse is FDA approved for injecting into laugh lines and restoring volume to the face. Other uses include injection into marionette lines, and augmenting your cheek bone structure to restore a more youthful look. Some refer to this as the non-surgical face lift. We are adding a substance, so can my nose look bigger? A commonly asked question is whether this procedure can actually make one’s nose look bigger. This is not the case as by taking away nasal irregularities and creating more symmetry through nasal contouring, the nose actually looks smaller and more proportional to one’s face. The nose serves as a central focal point when we look at a person’s face. When you restore symmetry back to this important structure in the middle of the face it actually looks smaller in the facial frame. Another important point is that we can actually make noses appear narrower. The perceived width of the nose is highly influenced by the height of the nose, and if you create a taller nasal bridge, one’s nose appears much thinner. Traditional rhinoplasty is a procedure done under IV sedation or general anesthesia with several weeks of downtime and a relatively painful recovery. Patients are routinely severely bruised for several weeks. The non surgical nosejob is done after only application of local numbing cream for about half an hour. , Unlike a rhinoplasty where the patient is unconscious, with this procedure, the patient is an active participant in the procedure. The patient has a mirror in his or her hand and can help guide the procedure. There is virtually no downtime, so one can return to work or social life immediately. People can be mildly swollen for a few days and rarely get slightly bruised. In a study which Dr. Rokhsar presented in October 2006 at the American Society for Dermatologic Surgery, 50 percent of patients can get mild bruising which may last for 3 to 4 days and mild swelling for several days. There is very little post-op pain if any at all, unlike several weeks of pain involved with traditional surgery. Just like the use of Botox has revolutionized the way we think of treating forehead and frown lines, this technique has revolutionized how we think of changing the shape of an individual’s nose. If you have always desired to have a smoother profile but have been apprehensive of surgery due to risks, pain, and downtime, then consider this non-surgical 15-minute nose job as an alternative procedure. Please make an appointment to discuss if the non-surgical (15-minute) nose job is right for. A drooping nose can be the natural result of aging. The nose is constructed of cartilage which can weaken and separate at the lower end. The force of gravity pulls the tissue of the nose downward, causing it to droop and often lose volume. As a person ages, the nose may seem more prominent because of the hollowing of cheeks and eyes due to fat drooping. 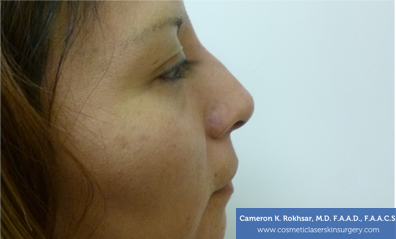 Dr. Rokhsar can perform rhinoplasty, also referred to as a nose job in order to lift the tip of the nose. This surgery approves the appearance and proportion of your nose, enhancing facial symmetry and decreasing structural abnormalities. During rhinoplasty surgery, local anesthesia is administered and incisions are made to access the bones and cartilage that support the nose. Depending on desired results, some bone and cartilage may be removed and/or tissue may be added and the nose is recovered with its skin and a temporary splint is placed outside the nose in order to support the new structure while it heals. Puffiness and bruising will remain for up to two weeks while the body heals, and cold compressions are encouraged for a more effective and quick healing process. Those that are surgery averse can opt for the non-surgical nose job which users a filler substance, such as Radiesse, that is injected through controlled precision to reduce dents, bumps, and deviations, including a droopy nose. The procedure is significantly shorter than surgery and requires no downtime. The results can last up to two years. 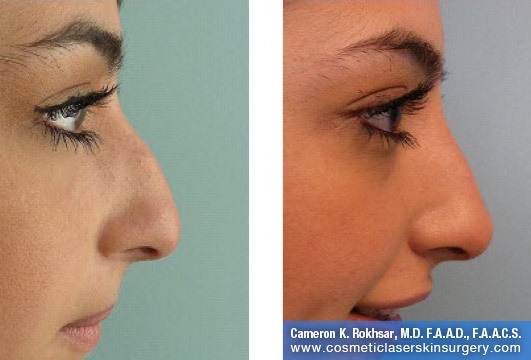 Dr. Rokhsar is the first to write a scientific paper on a non-surgical nose job and has perfected the technique. Dr. Rohsar has developed the nonsurgical nose job and has been the invited expert on shows such as ABC News to discuss its advantages. The procedure is done under numbing cream, takes 15-minutes, with virtually little or no pain, bruising or swelling. You can return to your work or social life immediately with instantaneous results. Radiesse is an FDA approved filler substance.